You are a high-achieving professional with multiple talents and many interests. Do any of these situations sound familiar? You try to incorporate so many things into your life –each of them important –that you end up feeling scattered, anxious and exhausted…and without the results you wanted. You want to be given a broader scope of responsibilities in your current job so you can use more sides of yourself more often. You want to embark upon the entrepreneurial route, and start your own business. But oh….which one? There are so many you could do and could excel at. You’ve become well-known in a specific field, or for a particular talent, but you feel “pigeonholed” by it, knowing there is so much more to who you are that you want to share. Although you appreciate your numerous talents, you also feel overwhelmed by your own pressure to maximize on all of them and reach your “full potential.” But how? Where to begin? The good news is, you do not have to choose! Picking “Just One Thing” for people like us simply doesn’t work, but there is a great life of peace of mind and productivity just waiting for you. 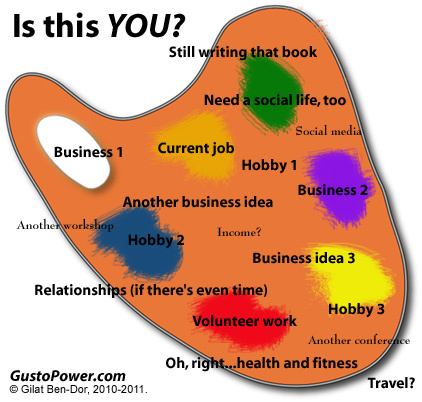 The GUSTO POWER® Life Design Program was designed by Gilat Ben-Dor specifically for YOU. Learn more about how GUSTO POWER® can help with your personal and professional development here. © 2019 GUSTO POWER®: Life Design for the Multi-Passionate Professional™. Powered by WordPress. Theme by Viva Themes.